The autumn growing season has many attractions, including fewer weeds, milder temperatures, and the opportunity to try special radishes that are happiest growing at the season’s tail end. Asian radishes including daikons (also known as mooli radishes), Chinese radishes, and watermelon radishes are great fun to grow as summer turns to autumn, but you’ll need to get busy. Asian radishes grow slower than little salad radishes, so they are best planted about eight weeks before your first frost date. Warm soil temperatures promote fast germination, so the seeds will be up and growing in a matter of days. In China there is an old saying that “when the radishes are in season, the pharmacists can close their shops.” There is some truth here, in that a review of studies from around the world concluded that compounds in daikon radishes may help prevent diabetes, cancer and disorders of the digestive system. Then factor in that daikons are a pickler’s dream, whether you ferment them in a salt brine or turn them into spicy Vietnamese-style refrigerator pickles. You also can cook daikon radishes into a soft and savoury vegetable as is done in Chinese turnip cake (law bok gow), which is really made with radishes. There are many ways to enjoy the “little ginseng” of the vegetable world. Daikon radishes have long, upright leaves with wavy edges, and some varieties can develop roots more than 12 inches (30cm) long. Unharvested daikons make a good winter cover crop because the big roots drill deep holes into the soil, which are then enriched by the rotting radishes. Some of the newest daikons are purple rather than white or green. Violet ‘Sweet Baby’ won an All America Selections Award in 2016 for its taste, vigour and uniformity. The popularity of purple daikons is growing fast. Often called Chinese radishes and introduced to western home gardeners a only a few years ago, ‘Red Dragon’ and ‘Pink Dragon’ are refinements of the old ‘Shunkyo’ radish of Northern China. The leaves are thin, smooth and hairless compared to other radishes, with attractive red stems. Some people rate the leaves as edible, but I’d rather hold out for the large, red-skinned roots, which pop up out of the ground when they’re ready. The crisp radishes are mild enough to eat raw or cooked, they make a great refrigerator pickles, and sound specimens will keep in the refrigerator for months. The round radishes with red interiors called watermelon radishes have a more poetic name in their native home of China – shin ri mei, or “beauty in the heart.” These round radishes grow to 4 inches (10cm) in diameter, and they have more vitamin C than other Asian fall radishes, perhaps because of their vibrant interior colour. Popular varieties include ‘Red Meat’, ‘Mantanghong’, ‘Misato Rose’ and ‘Stargazer’. Thin slices of watermelon radish turn any salad into a rainbow, or you can pickle them to add colour and crunch to sandwiches. Expect to be inspired by these long-storing beauties. 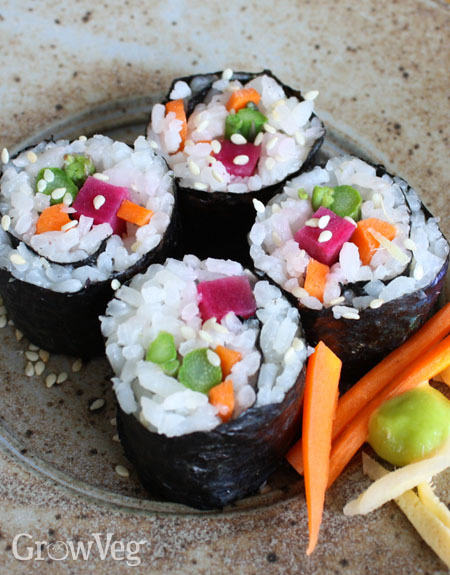 I used lightly blanched watermelon radish sticks to mimic tuna in vegetarian sushi. Watermelon radishes have stiff, serrated leaves that resemble those of turnip, and the only tricks to growing them are to plant them early enough so they mature before cold weather, and thin them early on to at least 4 inches (10cm) apart – two needs common to all Asian fall radishes. To prolong storage life, it’s also important to trim off the leaves as the radishes are harvested. Then wash the radishes, pat them dry, and store them in plastic bags in the refrigerator. They will keep for months.